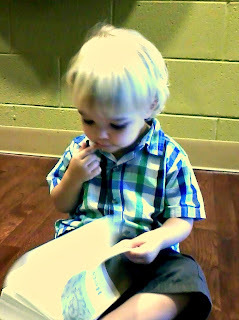 Here is my sweet boy at church flipping through a Bible. He has started asking for Bible stories at nap time & bed time!!!! You will need to get him the "Alice in bibleland" stories. They are so fun to read. Also we got our son a superhero devotional book when he was about that age. It has a blue cover and is about ways little boys can be super hero for Jesus. Thank you for being a great inspiration as an art teacher and as a man of faith.